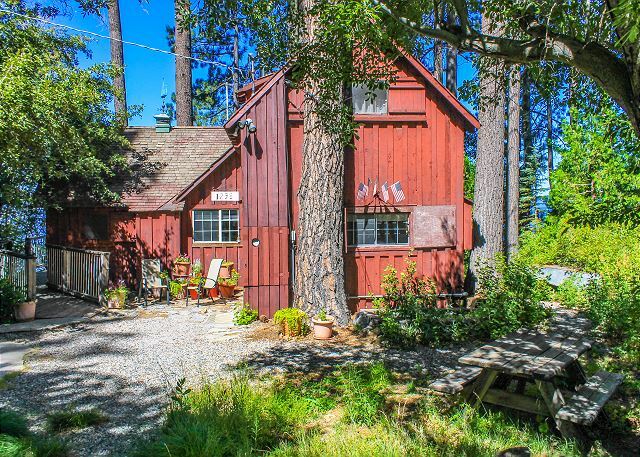 This little red cabin was originally built in the 1920's and is still owned by the same family. Aside from the kitchen appliances, new TV's, new bedding, and furniture, not much has changed from the 20's when the house was built. 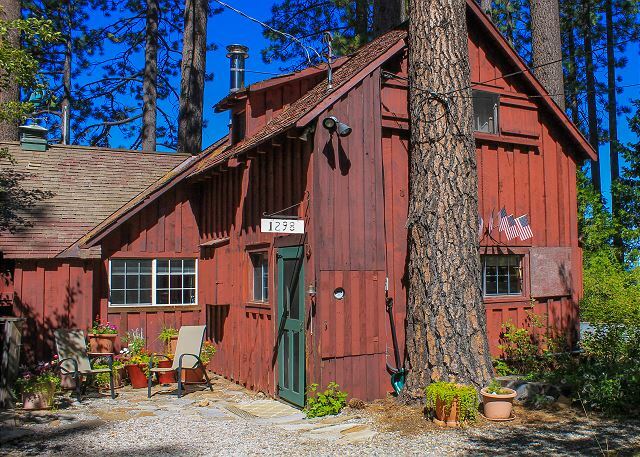 You will experience a truly rare vacation staying in this little 3 bedroom cabin. 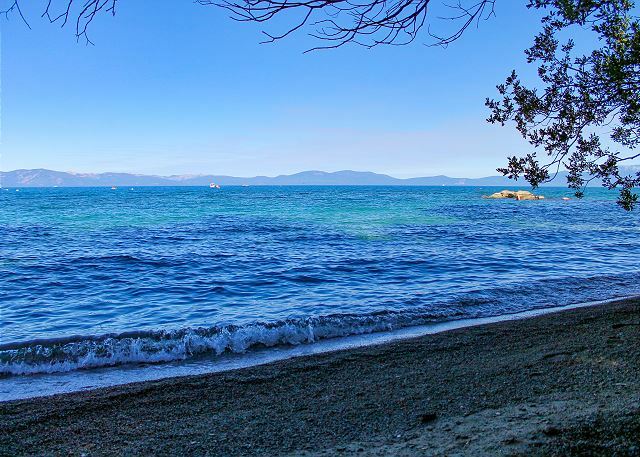 There is an amazing view of the lake and Cave Rock, you are lake front with a bit of beach area depending on the water level, and still close to town. Being that this cabin was built in the 20's the floors are not even, the stairs to the loft bedroom with a queen are steeper that any normal stairs, and there is actually a tree that the house was built around! 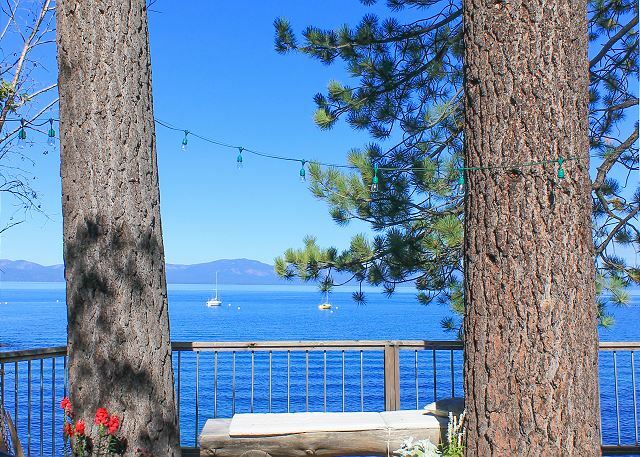 This is something that you will rarely get to experience in Tahoe! You enter into the cabin through the kitchen. In the kitchen you will find a dishwasher, 4 burner glass cook top, microwave, oven, refrigerator, coffee maker, & toaster. There are pots & pans, silverware, cups, plates etc. We do not supply any food items at all like spices, oils, sugars, coffee etc. The old fashion cast iron stove you see in the kitchen is not in working condition and is only there as decoration. The floors in the kitchen are uneven as the house was built in the 20's, the wheels on the block island must stay locked so it does not roll away, all part of the fun of this little cabin! Through the kitchen you enter into the living room. 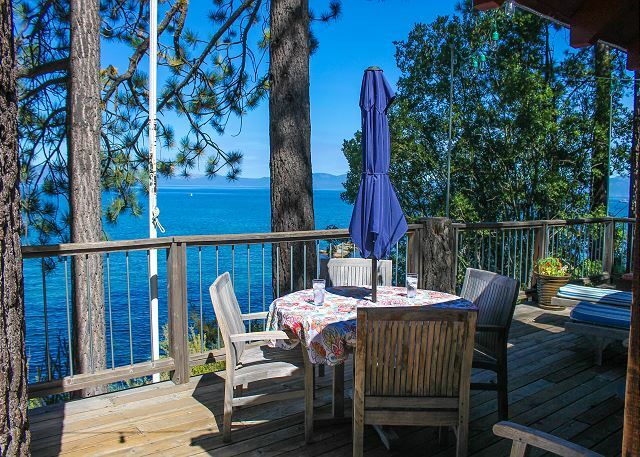 There is a wood burning fireplace (wood is not provided) a new TV, dining table & access to the deck area and beach/ lake area. The one full bathroom is off of the living room. There is a stand up shower, toilet and sink in this bathroom. There are 2 bedrooms off of the living room; BR 1 with a queen & twin, BR 2 with a twin. Above the kitchen is the loft bedroom # 3. There is a door to this room making it private and we call it a loft as the ceilings are angled like a loft. There is a toilet room (toilet and sink only) and this is where the house was built around a tree! Open the window in the toilet room and you get to see the tree, what an experience! There is a BBQ off of the kitchen area in the back of the house in the gravel area. 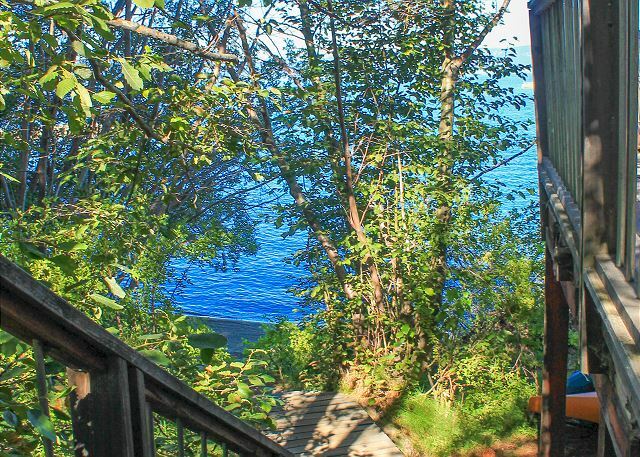 We cannot put the BBQ on the wood lake view deck for fire safety reasons. There is no dock, we do not supply water toys of any kind or boats of any kind. Parking and boats: The driveway is large and you can fit a boat trailer, you can launch your boat at cave rock area. There is no docking, buoy or a place to tie up the boat on the beach, you would have to load and unload the boat every day. 3. Parking: 5 cars allowed at house at any time. 4 cars and a truck and boat trailer are ok. You must have all vehicles and trailers in the driveway. There is no street parking per county and fire safety rules. Failure to comply will result in loss of security deposit. Rooms Sleeps 8, You may have 8 people at the cabin, there is only sleeping for 6 in beds.